These are the socks I mentioned in my last post, bespoke by the Resident Male as a gift for his hip replacement surgeon. A frenzied week of knitting, to be sure, in order to be ready to be given at the scheduled follow-up appointment. I will say that both TRM and the socks have knit up well. Thanks to all for the get well wishes. He’s hobbling around quite spryly with cane, and gains movement range and strength every day. 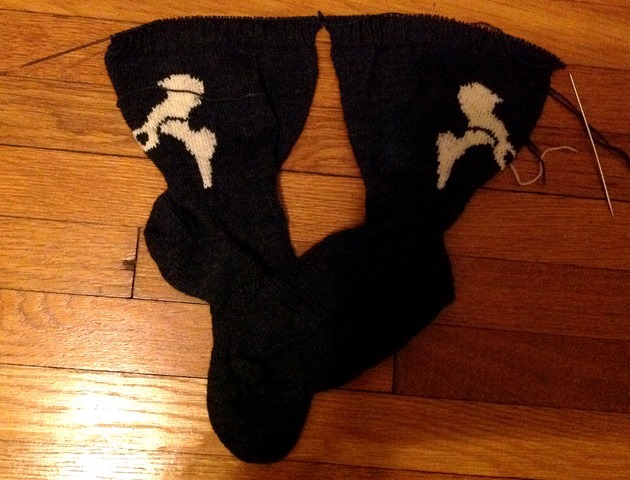 On the socks, as previously posited, I worked them on two circular needles, in the round on 80 stitches around (US #00s) with figure-8 toe and short rowed heels. I kept on that way until just after the completion of the heels, then splitting them at the center back, adding a stitch to the new left and right edges for later ease in seaming, and then continuing to work side by side, but this time, flat. All in all, while I was happy to fulfill the special request, and interested in the experiment of working a pair on two circs with an Intarsia clock, I have mixed feelings about this project. If I had more time, the socks would be about an inch longer before the ribbing. The proportion would be better. I still am not a fan of Intarsia. That’s my mother’s favorite style of knitting. I vastly prefer textures, lace and stranding. Taming the multiple bobbins or yarn butterflies drive me crazy, no matter how careful I am at always using the strands in the right order and orientation. 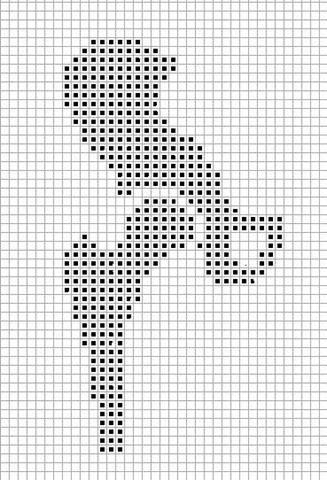 I should have used proportional graph paper rather than plain 1:1 squares when I charted the hip. The stitch height:width ratio has flattened the design somewhat, and has lost some of the more gracefully round curvy details. Here’s a place to make printable graph paper in any proportional ratio you need. I have and will probably use two-circs again for larger things like sleeves, but I don’t like that method for socks. Not one bit. Stopping to assort the needles and yarn slows me down big time over plain old DPNs. I know others adore the method, but it’s not for me. 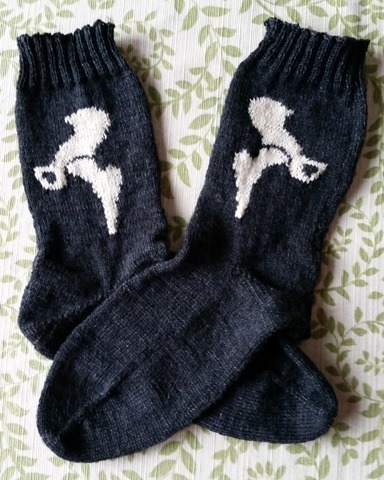 On the up side, the socks are complete. They are the right size (I aimed at a guessed shoe size of men’s US 12-13, for a 6-foot guy), and although just a tad short from heel to ribbing, are totally wearable. The motif sits well in place, and the copious end-darning doesn’t create uncomfortable ridges inside. The mattress stitch seam worked perfectly, and the result is invisible from the outside of the work.